Any personage of significant worth has an entourage. Usually your minions come at a cost (usually crowns) but there is a free minion you can get from the Thieves’s Guild quest line. This one will assist you any items of questionable ownership. Complete the quests offered by the Guildmaster Zeira, Thieves’ Den in Abah’s Watch, and in the end you will be rewarded with Pirharri the Smuggler. Pirharri will offer to fence your stolen items for a 35% fee. 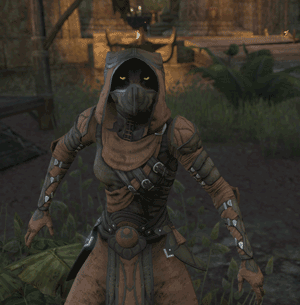 You can offset some of this fee by investing in some skill points in the Thieves’ Guild Skill line passive Haggling (Rank 12 in Thieves’ Guild required for maximum 4 points). Tip: 105 Achievement points can be earned by fencing 4,000g worth of items at various locations around Tamriel: Magnanimous Magnate (50), Eagle's Nest-Egg (15), Dragon's Hoard (15), Lion's Golden Pride (15), Merchant Lord's Coffers (10).